Our Amish Fifth Avenue Bookcase boasts fluted accents, dentil moulding, raised panels, brass hardware and long-lasting quality that will withstand years of use. 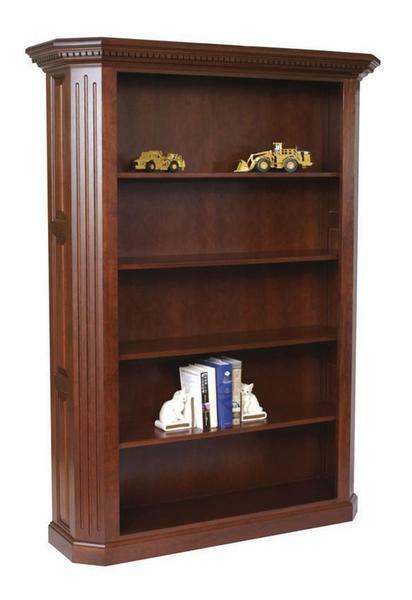 This Amish made bookcase is available in a variety of wood types and stain choices. The Amish bookcase back is made of plywood from the same type that you choose for the bookcase. Anyone looking for exceedingly functional office furniture that will communicate professionalism and durability will be pleased with the Amish Fifth Avenue Bookcase. Custom sizes available upon request on our Amish furniture. Please call to speak to one of our Amish furniture specialists with questions or to proceed with an order.